This light and lovely Caprese Pasta Salad with Balsamic Dressing is a taste of my recent trip to Verona, Italy. It takes 15 minutes to throw together and is filled with the simple but beautiful colors and flavors I experienced abroad. 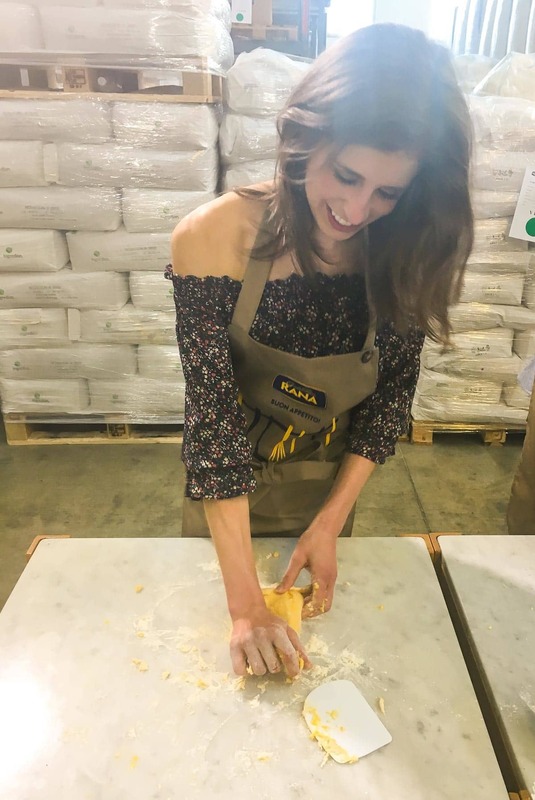 In one of the greatest “pinch me” moments of my blog life and my real life, Giovanni Rana, a family-owned Italian pasta company, invited me to tour its factory outside of picturesque Verona. I expected the tour to be interesting, the scenery to be lovely, and the food to be scrumptious. It was, after all, Italy. What I didn’t anticipate? Feeling as if I’d been adopted into a new, vibrant, pasta-loving Italian family after just three days. I also didn’t expect the product’s production to impress me as much as it did. I can honestly say that after this experience, I will never view fresh pasta, especially filled fresh pasta such as ravioli and tortellini, the same way again. Going into the trip, I knew from Giovanni Rana’s website that the pasta was made with “fresh” ingredients. Had you asked me what the term “fresh” really meant, however, I couldn’t have told you much. To me, “fresh” was more than likely a cool buzzword that companies slapped on packaging to make their products sound more wholesome than a sign of actual quality. Then, I toured the Giovanni Rana factory. “Fresh” could not be more literal. I witness cartons of real mushrooms and radicchio being cooked for pasta filling. Refrigerators the size of my house opened to reveal rows of fresh basil that perfumed the air. Wheels of Parmesan and Pecorino cheese, along with slabs of prosciutto, and precious hunks of goat cheese were cut for us to taste before they made their way down the production line. When the company says “fresh,” it means it. Like, really, really means it. I’m going to go into more details about the company’s history and some of the trip highlights below, but I wanted to start with the freshness of the ingredients, because if you don’t take anything else away from this post, I want their quality and the completeness of the product to be what you remember. Pasta doesn’t only mean dry, packaged noodles that you smother with jarred sauce. As I witnessed firsthand, pasta can also be light, fresh, and a meal unto itself. 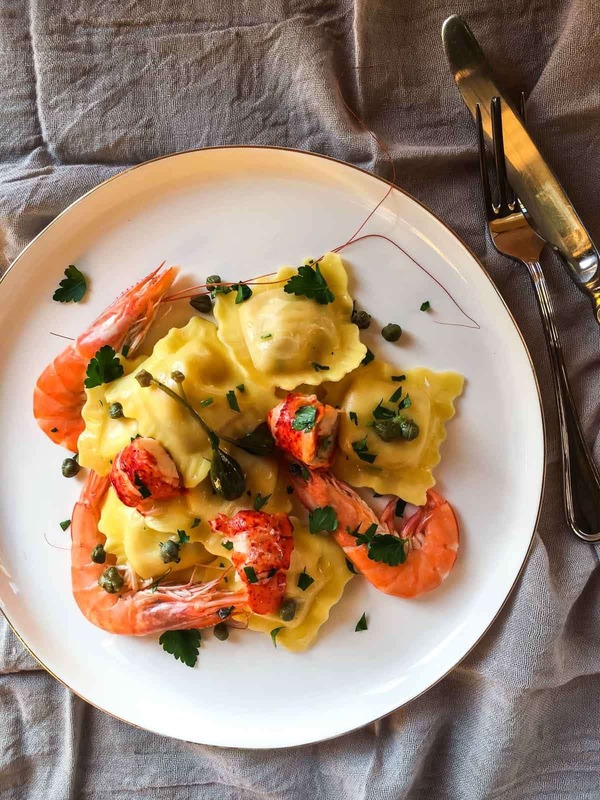 Because they already contain fresh ingredients, filled fresh pastas (such as the spinach ricotta or butternut squash, to name but two) need little beyond a bit of melted butter and sprinkle of Parmesan to be a complete meal. I took it upon myself to add extra veggies to this Caprese Pasta Salad, but I could have just as easily served the pasta alongside a salad for an equally complete meal. You’ll find the recipe at the bottom of the post. In the meantime, here’s a snapshot of Giovanni Rana and some tasty moments from our trip too. While we might not recognize him as quickly in the States, in Italy, Mr. Giovanni is a celeb and Rana pasta is a household item. 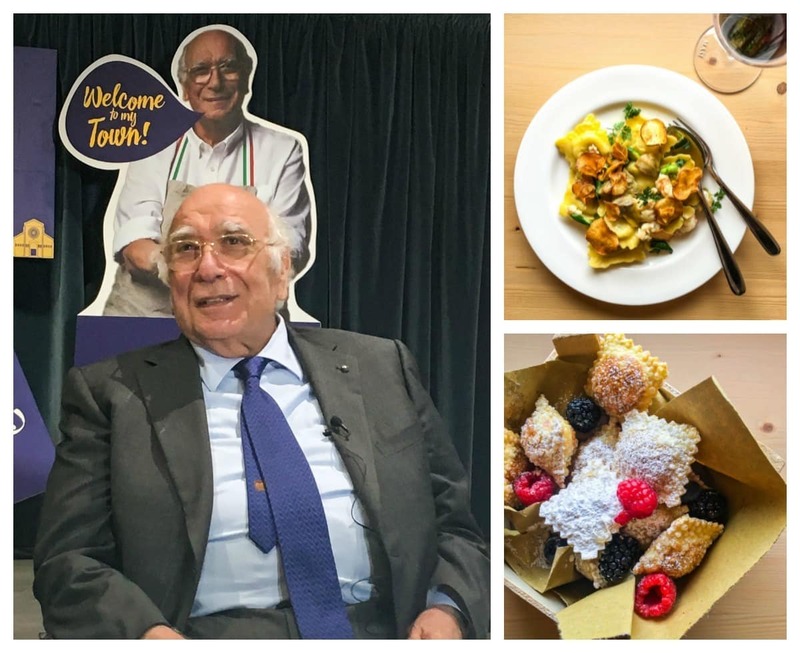 Giovanni Rana started the company in 1962, when women began entering the workforce in larger numbers and no longer had the time to make pasta from scratch daily. Back then, the company had two employees: Mr. Giovanni, who made the dough, and his wife, who made the filling and shaped the pasta. Fast forward to today. 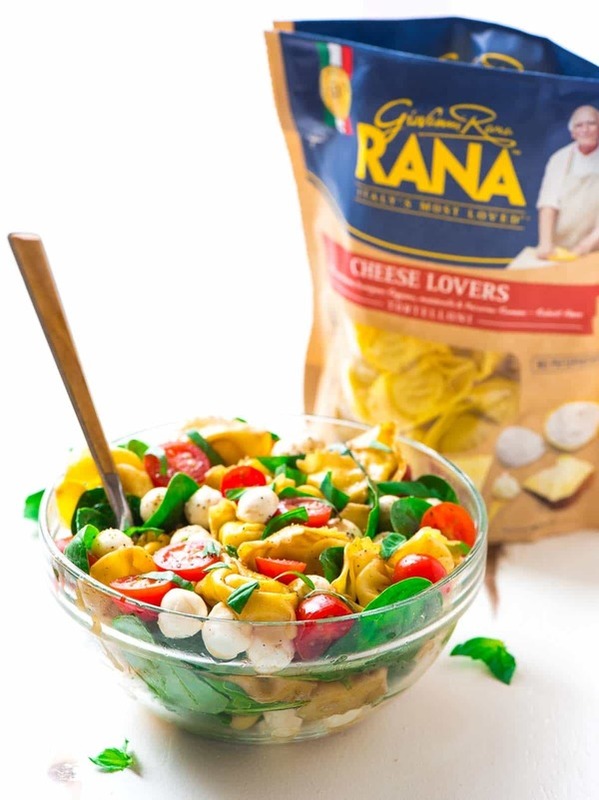 You can find Giovanni Rana pasta in refrigerators all over the world (including in the U.S.), and the employees number more than 3,000. What has not changed, however, is the Rana family’s passionate dedication to quality. I’ve never met a group of people this in love with fresh pasta or committed to sharing it with as many people as possible. The company’s CEO is now Mr. Giovanni’s son, Gian Luca Rana, who took a precious Saturday to give us a personal tour of the factory. Afterwards, his wife taught us to make fresh pasta from scratch by hand. Spoiler: it’s harder than it looks. The Rana family did so much to make our time in Verona special. From a gourmet four-course pasta and wine pairing lunch at Masi winery, to an epic bash in Gian Luca’s home that included three enormous food stations, each highlighting a different region of Italy, to a black-tie event in a lake-side mansion (seriously), this trip was beyond dreamy. 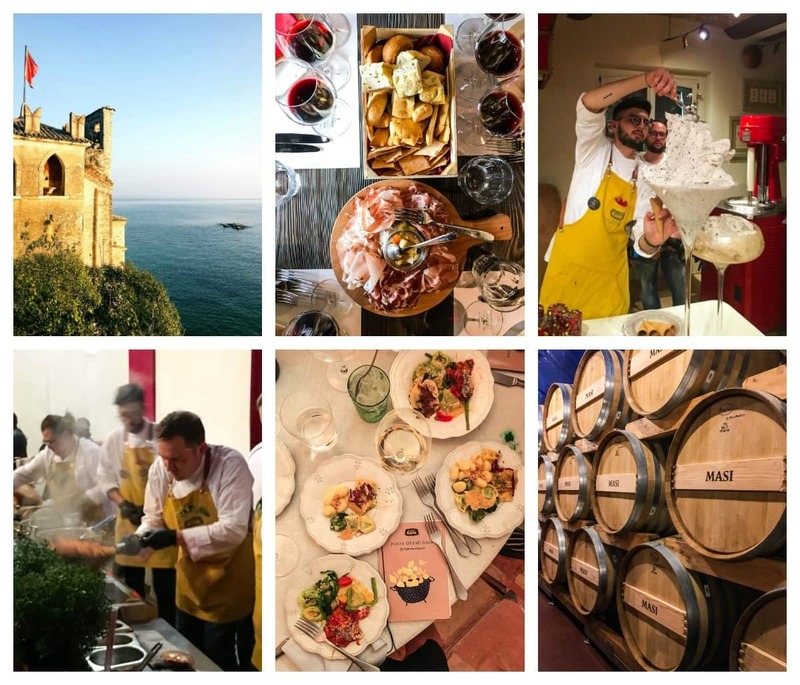 We played tourists in Verona, food stylists in a hands-on pasta styling session (where we had a spread of beautiful ingredients to choose for our creations), and party goers at some fantastic evening soirees. 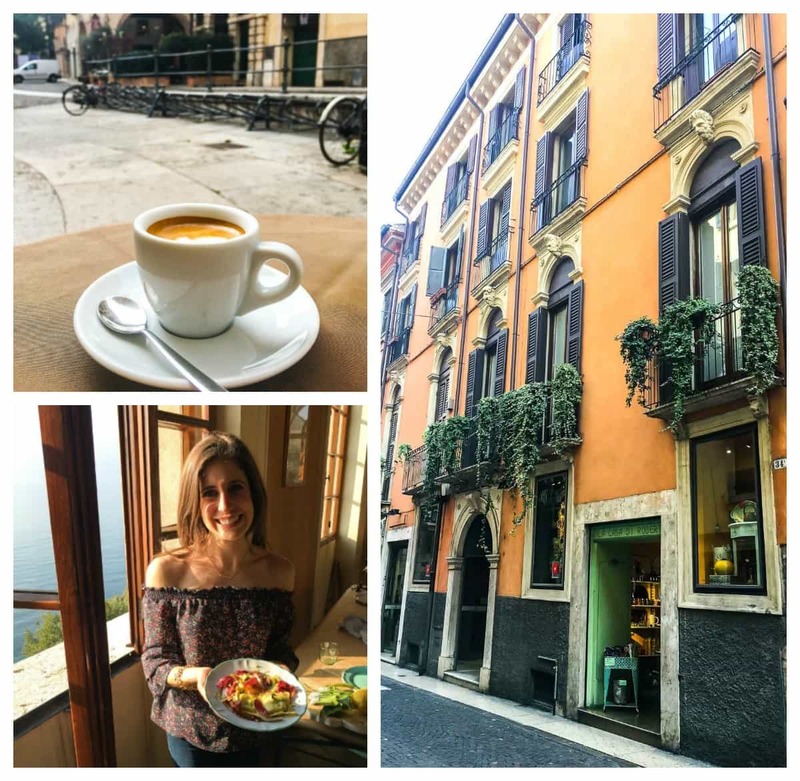 Although it didn’t surprise me that we ate pasta—a lot of pasta—every day of the trip, what did give me pause was how we ate it. My concept of pasta since childhood is that it’s an ingredient I find in my pantry and turn into a complete meal via the addition of veggies, protein, and other deliciousness (reference: the entire pasta section of my recipe index). While this is certainly true, the fresh, filled pasta was an entirely different concept. Not only is fresh pasta found in the refrigerator, but it’s almost a meal on its own. Once it’s cooked (which only takes about 3 minutes, by the way), all you need to do is lightly dress it with a few fresh ingredients, and you have a complete, delicious meal. None of the pasta that I tried felt over-sauced or excessively decadent. It was light, made with wholesome ingredients, and felt more healthy than heavy. The same can be said for today’s Caprese Pasta Salad. I used the Giovanni Rana Cheese Lovers Tortelloni to make it, then added flavor simply, via fresh tomato, basil, and mozzarella pearls. Instead of sauce, I mixed together a tangy balsamic vinaigrette. Start to finish, the entire dish was ready in 15 minutes. 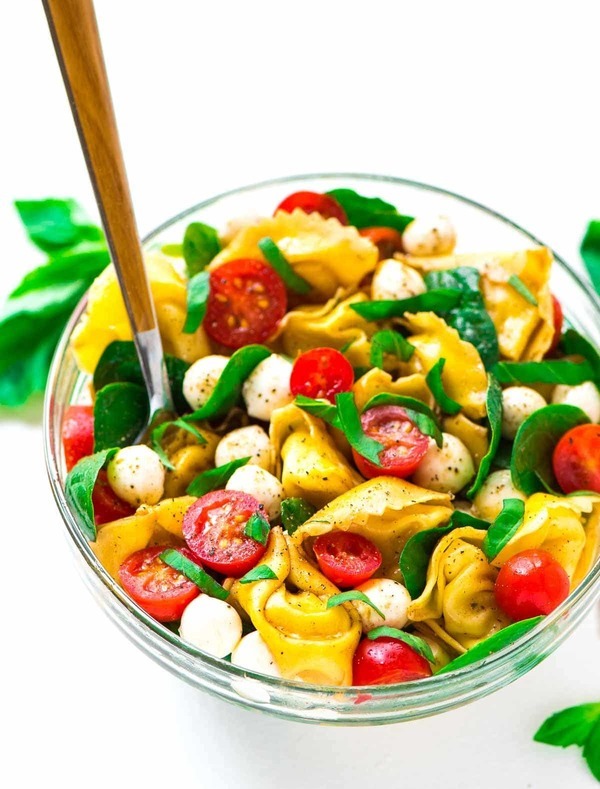 If you are looking for a winning potluck dish for upcoming outdoor festivities, a quick dinner, or a light lunch that’s easy to pack for work, this Caprese tortellini pasta salad is an ideal choice. Its combination of ingredients is timeless, it’s ultra easy to make, and it tastes just as wonderful leftover as it does the first time you try it. It’s also an excellent way to visit Italy without leaving the comfort of your kitchen. 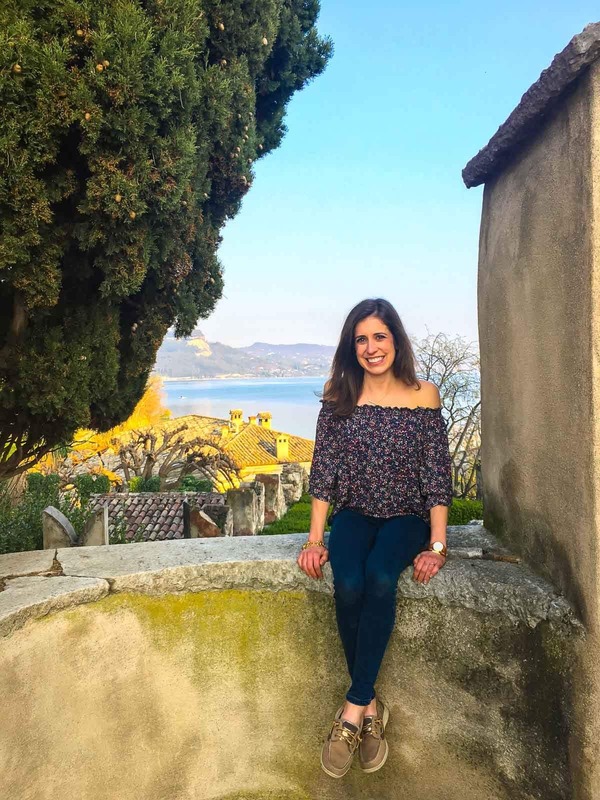 I’m not sure if or when life will lead me back to Italy, but I am so grateful to have had the opportunity to experience it in such an exceptional way. Thanks for reliving the adventure with me, and I hope you enjoy this Caprese Pasta Salad as much I as did too! 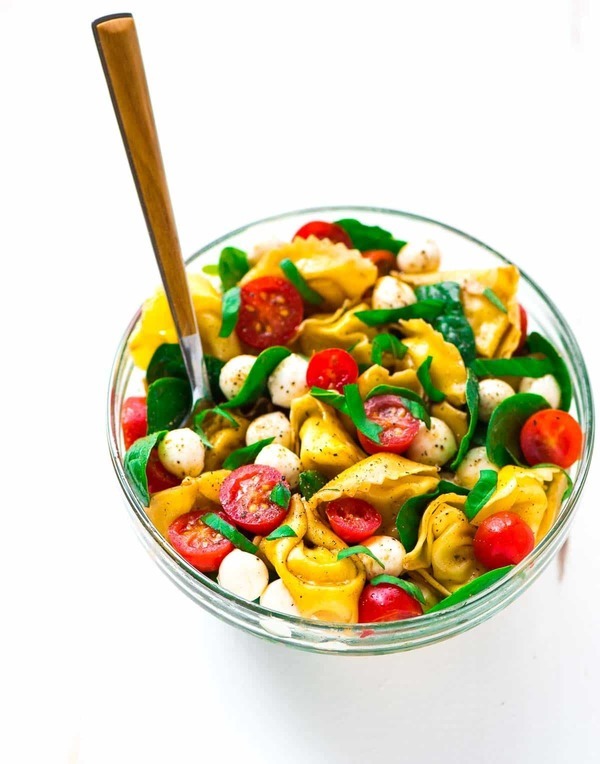 Love Caprese-inspired recipes like this Caprese Pasta Salad? Don’t miss my Caprese Chicken Pasta. It’s a reader favorite! This Slow Cooker Balsamic Chicken has many of the same flavors too. 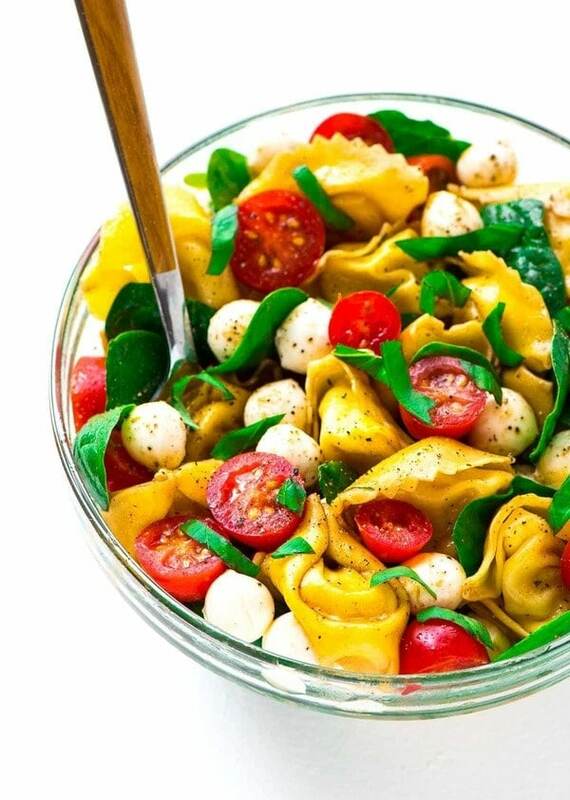 Caprese Pasta Salad made with tortellini, tomato, mozzarella, basil, and balsamic. Fresh, easy, and a perfect simple side, appetizer, or light dinner. Bring a large pot of water to a boil. Cook the pasta for 3 minutes, until just al dente. Drain and rinse with cool water. Shake off as much excess water as possible, then transfer the pasta to a large serving bowl. Add the baby spinach, cherry tomatoes, mozzarella, and basil. To make the dressing, in a small bowl or measuring cup, stir together the olive oil, balsamic vinegar, honey, salt, and pepper. Pour over the pasta and toss to coat. Enjoy immediately or refrigerate for up to 1 day. Thank you Giovanni Rana for hosting me on this special trip to Italy. As always, all opinions are my own. I wasn’t paid to write this post, and I truly enjoyed sharing my adventure with you. Thanks for reading! It IS incredible! Thanks, Medha! Your pictures are wonderful. It sounds like such a great trip! I ADORE caprese anything, so this sounds absolutely delightful. It’s very colorful! Looks like a piece of art :-) I love the way you mixed together a tangy balsamic vinaigrette instead of sauce. Thank you! hey girl- this looks so yummy! I would love to visit Italy! such pretty pics! Italy really is beautiful, Shawnna! Thank you so much! Awesome story! Sounds like a great experience, and this recipe looks fresh and delicious as well. Thanks! This was so good and healthy! I was not sure about the spinach but it does add to the flavor. I used my homemade balsamic vinegarette dressing, leaving out the honey. The Rana tortellini was perfect. It didn’t fall apart when cooking and did not get “mushy” like so many do. Thanks for your sacrifice in Verona to tell us about it !! I will make this at lest once a week. Cindy, I’m so happy to hear you enjoyed the salad! I could probably eat it once a week too. Thank you so much for giving it a try and reporting back! I loved this recipe! I unfortunately made the mistake of adding all the dressing to my salad and it made it too wet! People don’t be shy of the spinach it goes so well with this dish! I doubled my serving! Thanks so much for leaving this awesome review, Allie! I’m so glad you enjoyed the salad. I just made this and it’s a keeper! I love how light and clean it feels to eat even though it’s a pasta dish. Perfect for a summer lunch when tomatoes are abundant, but like another commented, I could eat it on a regular basis all year long! I was heavy handed on the spinach and basil and used white balsamic vinegar to keep the veggie colors bright. Thanks also for sharing about the factory and people behind the Giovanni Rana company; very interesting and you are lucky to have experienced it firsthand. 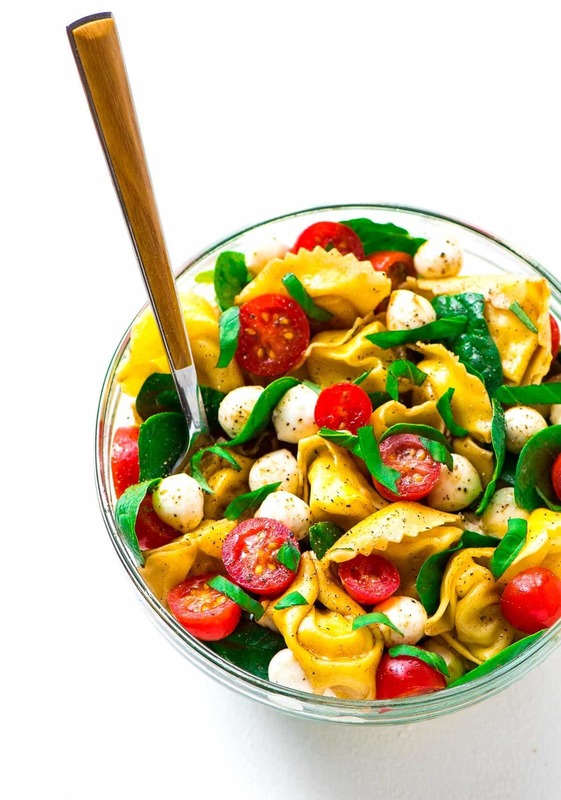 Wow, Caprese Pasta Salad! I’m crazy about it. It’s so colorful & nice to see. I hope that would be delicious. Thanks, Erin for sharing a great post.